Helgis Inc. goes public with amazing new graphics card. Hi-Tech from Norway exclusively for the Amiga. As of late, with announcements of new PowerPC hardware popping up like moles in your garden, Helgis Inc., a norwegian based hardware company mainly specialised in the overclocking business, decided to go public with their newest hardware product aimed especially at the amiga community: The TaigaOle1 XXL. We were invited by Helgis Inc. to come to Norway to participate in a special private screening of this exciting new graphics board. "This graphics card - designed with the needs of the Amiga community in mind - sticks out with unique features," said Lobo Tomyslav, Marketing Manager of Helgis Inc. who was hosting the screening for Helgis Inc.
We learned that the graphics card incorporates 3 custom designed Graphics Processing Units (GPU's) at its core, named after outstanding and important Amiga personalities of all colours 'to honour their achivements'. The first and most powerful chip, labelled 'Hans, Jörg and Thomas' is responsible for the interfacing between the computer and the AGP slot, it contains the memory controller that handles the 512mb of on-board memory and it contains a very specialised algorithm to accelerate a new and as yet secret technology. 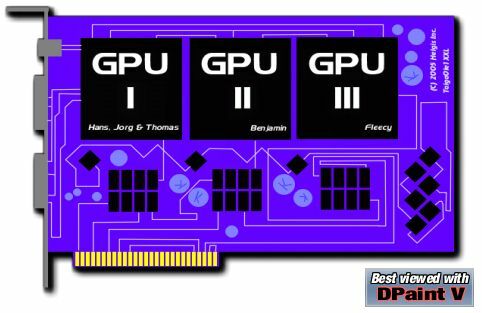 The 2nd GPU, named 'Benjamin', deals with communication between the 3 GPU's, it can output virtually an unlimited amount of polygons per second which will get textured, shaded, clipped and coloured in the last GPU nicknamed 'Fleecy'. When asked about what makes this graphics card especially valuable and irresistable for the average Amiga user, Mr. Tomyslav told us: "For the coolness factor we decided for a slick blue solder paste. This will make your PC friends have a second look at your Amiga, guaranteed!" We were given a technical drawing of V1.0 of the TaigaOle1 XXL, which we were assured is an older prototype from 6 months ago, and Lobo claims that, "The current version looks totally different from V1.0" to demonstrate their actual progress and the real existence of the board to us and you - the Amiga community. Rumour has it that Hyperion Entertainment already got several prototypes of the card and is working hard on the next implementation of their next generation Warp3D technology - codenamed GammarayBURST - to take advantage of the advanced features the TaigaOle1 XXL offers. Lobo Tomyslav couldn't give us an exact release date, but with a mere blink of his eyes he assured us that it will be released 'When it's done'. When asked for an estimated end-user-price he said, "We are sure the Amiga community will pay whatever price it may cost to keep the future looking bright". Amiga user Atheist and funding source of the project spoke to us about how, like the muA1, he feared that people would overlook the potential of this great new piece of true Amiga hardware. He said, "It's a TOUGH road, because big time investors are too stupid to see a gold mine when it's right in front of them, that's all." We'll keep you updated (promised). I wonder when this site will be closed down. I'm no expert, BUT the microAmigaOne, generally seems to be working fine. As soon as my stock rises like the Phoenix, I'll buy some Ram and test it. I don't go over there at all anymore. I couldn't care less what they're doing, and yet they keep coming here talking about it (AND denouncing our platform), like I don't know where to look, IF I was interested. The reason this place even exists is because we COULDN'T get along on Amiga.Org, AND Ann.Lu AND MooBunny, and totally forget MorphZone (at least the foul language would be more quickly moderated out than at Ann.Lu (and not at all on MooBunny, a VERY liberal board)). They EVEN HAVE a DEDICATED WEBSITE to slander, insult, humiliate etc. our side in the form of wrongpla.net. These clowns have NO redeeming qualities. You don't know that they work together (some may be paid), and loosely to cause trouble, confusion, and irritate the heck out of us. Check the sig you used to see why your type are no longer welcome on ANN, Amiga.org, MooBunny, OSNews or anywhere else. You're a joke, so we laugh. I despise deciet? Is that a character flaw? Despising deceit when he uses a system invented by Fleecy Moss and Ben Hermans. Is that irony or what. Fleecy? What parts of the system did Fleecy touch? Fleecy invented the licence which now means that OS4 is stuck on dead Terons instead of living, cheap Pegasos. I did write all that, but I didn't post this comment here. It's absolutely accurate, though. It would have been funnier if you had said it has expansion slots for upto 4 Gigs of ram, and can be overclocked to say 6 GHz, provided you use it in a meat locker, OR Norway, outside, in winter months, in the shadow of your house, only. (micro)AmigaOne! AOS4.0! Don't wait for the future, join it now!!!!! > I wonder when this site will be closed down. The lawsuit is in the works. This lawsuit is the next version of the Amiga lawsuit, it's a total rewrite of the legal challenge. It's brand new from the ground up, rewritten for the European Law system. And it's bloody fast. It's currently in beta testing at 20 external sites, and it's just about ready to go - in three more weeks. The components are ready, we just have to plug them together and go. Only I can threaten WrongPlanet! It must also be Zorro 4 to comply with Zico spec to be a True Amiga !!! PCI and AGP are sucky PC standards that don't even work properly !!! PCI is too Unix !!! this article of deceit was invented by members of the GENESI FUD STAFFEL ! but its lies were easily spotted, no way the "real Helgis"(tm) could have managed the papers for applying for a company !! !